This crochet snowfall stocking is the perfect addition to your rustic mantle! 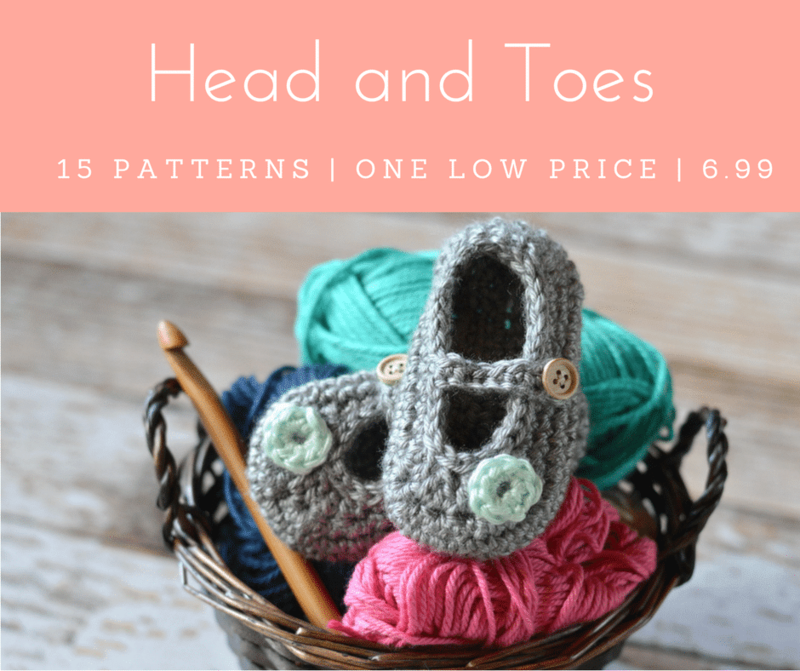 It’s made with chunky yarn so it works up quickly and beautifully. 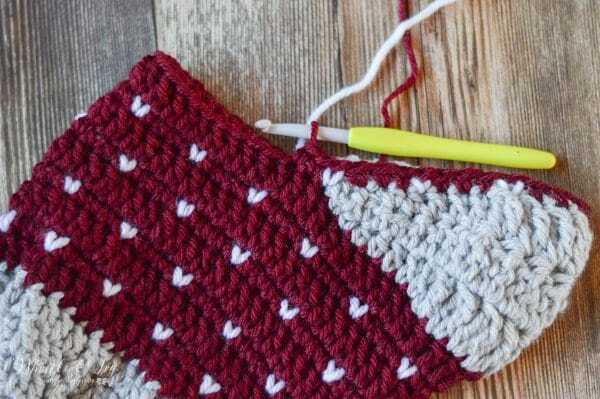 Enjoy the free crochet pattern for this pretty crochet stocking. Oh, how I love food. Thanksgiving marks the beginning of the simply wonderful treats and food that are in store until the New Year. Growing up, my favorite parts about Thanksgiving were the single-sized pies for all the grandkids and my grandma’s famous cheeseball with Ritz crackers. Even though things have changed, I am still very excited for Thanksgiving and what it represents in our family, a time of love and gratitude. It also means that I will be posting lots of fun Christmas patterns, yay! Isn’t it crazy how, as a child, the stretch between Thanksgiving and Christmas would drag on forever, but as an adult it’s barely time to trim the tree and get to everyone on your list. Well, today I am sharing this pretty Crochet Snowfall Stocking, in hopes you will have time to complete all the projects on your list, because it’s time to get going! Approx. finished size: 14″ circumference, 21″ long. 1. 10 dc in ring. Join with a sl st with the first dc. 9. Ch 1. *Sc 3. Work white sc in next st* repeat all around the stocking. Join with a sl st.
12. – 15. Repeat rows 8 – 11. Join Dove Heather 13 dc sts to the right of the join. The next steps are making the heel. You will be turning instead of working rounds around the entire stocking. b. Ch 1. Sk same st. Sc 2. Hdc 2. Dc 3. 2-Tc Cluster 9 times. Dc 3. Hdc 2. Sc in next st. Sk next st, sl st in last st. ( 23 sts) Turn. 17. Join Wine in 4th 2 -tc-cluster on the heel. Ch 1. *Sc 3. Work white sc in next st.* work three times. The last white st will be worked in the dc st that meets the heel. It will be a bit of a stretch, but it pulls the stocking into shape. 18. – 30. Repeat rows 8-11. To make a loop to hand it, Ch 10. Sl st down into the same st. Tie off. You are a genius! I have been crocheting stockings for many years, and this is the easiest one I’ve made. Taking it to a work party today for my secret friend. She’s going to love it. I think the snow looks like hearts! Reminds me of the verse, Wash me and I will be whiter than snow! Thank you! I used regular yarn and a G hook. Beautiful! This is very lovely :) So glad you like it! Thank you for the pattern. I’m actually making a stocking for one of my sons. This came at right time as I’m having trouble with the foot part. 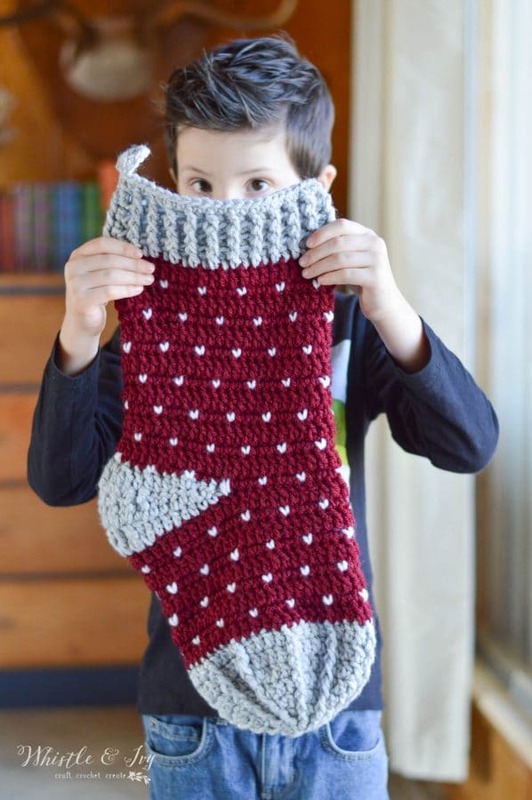 It is a beautiful stocking you made and your son is adorable. Have a wonderful Thanksgiving. Thank you so much Misty! That is wonderful it was such perfect timing. Enjoy your Thanksgiving as well! Just Adorable! Thank you so much for sharing your talents. Merry Christmas! 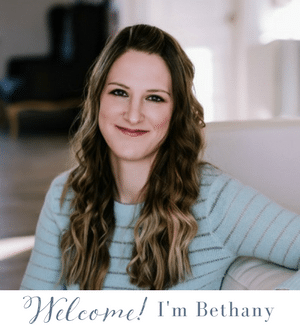 Thank you, Bethany! It’s a really cute pattern. Your son is so cute, too! Hi, this stocking is very cute and I’m making it for my “grand dog”. When I start on the row 9, it looks like it’s inside out. The small v stitches are not on the ribbed side. Any suggestions? Are you working from the inside of the stocking? Sometimes when working a dome shape, the piece will automatically curl up, so you are working from the inside. I see what you mean! I think I flipped it inside out when I changed the yarn to wine. Thank you! Can this stocking be made without the snowflakes? Sure, just work the entire row in sc without switching colors. I LOVE this and can’t wait to make one. 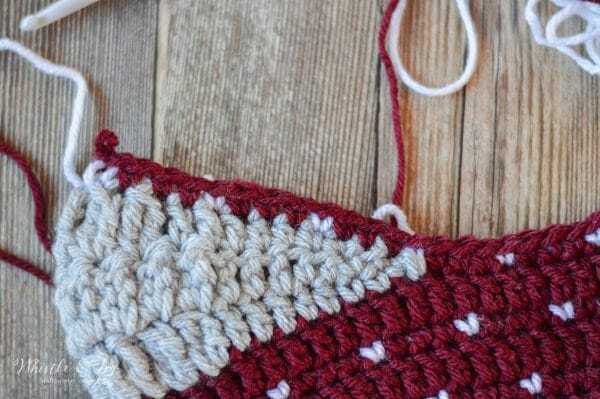 Do you carry the white through as you work, for the tiny single white stitches? yes! You can see how it’s done in the video. Love, love, love it!!! I have just made two. One for each Granbaby. Quick and easy to work up. They may need matching hats too!! Thanks so much for sharing this beautiful pattern! Yay! So glad you love it! You are very welcome! I’m a lefty, so I have inside out projects… When you say to do fpdc (or any specific post stitch like bpdc etc) should I invert those? That is, where you say to do fpdc, should I do bpdc instead and vice versa? Thanks! It should be find either way, as long as you are working a fpdc into a fpdc and a bpdc into a bpdc, so it looks ribbed. 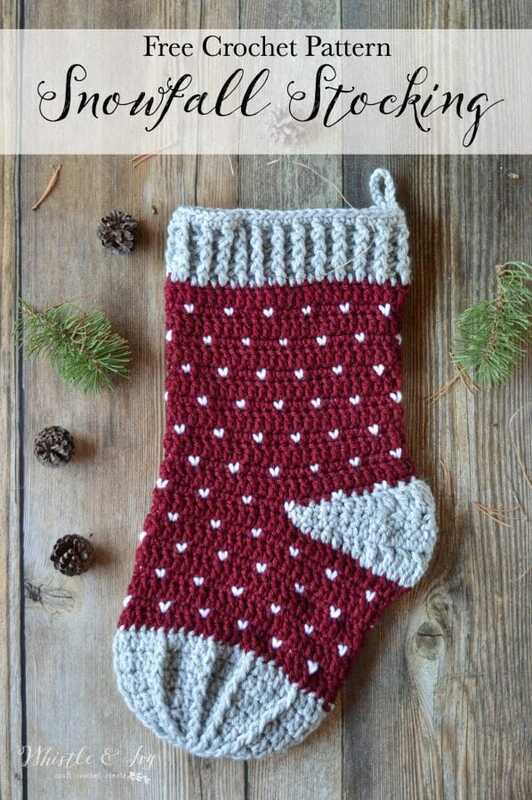 Love this stocking pattern! Thank you for offering it for free!. I have been seeing this term in patterns lately, “break”. Does this mean cut the yarn, or just switch to the other color, or something altogether different? Thank you! Sorry you are confused! Which part are you referring to specifically? I’m just getting used to terms. I did the first 7 rows several times before it started to look right. It’s okay. I’m figuring it out. I think the more I do, the more I’ll get used to the terminology. You tie off your yarn first before cutting. I guess you could call it a slip stitch. on the last loop, you’re creating a chain and pulling the yarn all the way thru to create a knot. Hi there! Your finished stocking is just beautiful and I am busy working on the pattern right now! I am having trouble with the heel section. I am on part a. And I am ending up with 34 stitches instead of 25… I think I’m missing a turn somewhere, but I don’t know where. Can you help point me in the direction I’m messing up on? Hm, are you working 9 tc clusters or 18 sts there? I have a video demonstrating this stitch right above the step on the page, or in the abbreviations list if you are looking at the PDF. Me again! You’re gonna end up kicking be out! LOL so far, the stocking is beautiful. I am working the heel now. First: I joined the yarn the way you do in the video for the mini stocking. So, with new yarn, I pulled the loop through at the 13th st (between the 13th and 14th dc posts in the prev row), yo and pulled through to ch 1. I did a sc in the same st. Then I did two more sc to make the sc 3 as per instructions. Correct? Or was I supposed to start the sc 3 in the next st after the ch 1? Next conundrum: in stitch legend, you say Tc cluster = Tc2tog (the tc decrease in the video) worked in one st instead of two, but in the pattern, you say 2-Tc cluster 9 times. 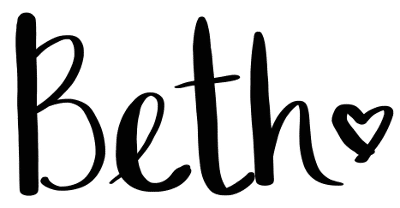 Does that mean two clusters in one stitch (therefore 18 clusters in 9 stitches)? Or one cluster (Tc2tog in sm st) per each of the next 9 sts? Join in the actual stitch, the 13th st to the right of the join. Then 3 TOTAl sc stitches, starting in the same st.
A tc cluster is NOT a tc2tog. A tc2tog is a decrease stitch, worked over two stitches. A tc-cluster is a tc2tog worked in ONE stitch, so the number is not decreased. It’s the same as working one tc, but it’s a wider and fills out the space more (I explain this in the video). So you will work 9 sts = 9 clusters. Okay, I am rereading your comment and I see you understand the Tc cluster, my apologies! The tc cluster is one stitch, so you will work one of them in each st, 9 total. Thank you!! Seems I interpreted correctly! Yay! Though as a lefty, I actually started in the 13th st to the left (a tip for all your lefty fans: remember that most of the instructions on any pattern are reversed when done left-handed). In this instance, the FPDC for the toe DID NOT need to be changed to BPDC and since it’s alternating for the cuff, it shouldn’t matter then either. What is the approximate size of this? ?